This is a serious pregnancy condition that occurs when the blood vessels and other parts of the placenta grow too deeply into the uterine wall. Generally, the placenta detaches from the uterine wall after childbirth. 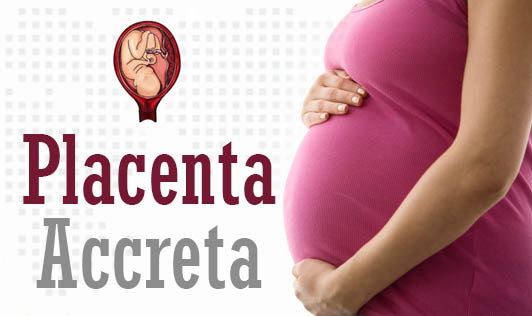 With placental accrete, a part or the entire placenta remains strongly attached. This can cause vaginal bleeding during the third trimester of pregnancy and severe blood loss after delivery. Placenta accrete is thought to be related to abnormalities in the lining of the uterus, which may be caused due to scarring after a C- section or due to other uterine surgeries which might allow the placenta to grow too profoundly into the uterine wall. This condition may not cause any symptoms during pregnancy- although vaginal bleeding during the third trimester is likely. • Maternal age, especially in women older than 35. Please contact your doctor right away if you experience vaginal bleeding during your third trimester!